The Corning® Scholar hot plate is the most economical and efficient choice for your heating needs. 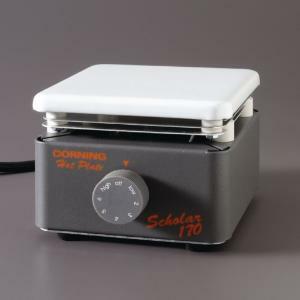 Its compact 5x5" design minimizes wasted bench space and featured a white enameled steel top for maximum heat conduction. Due heat shields ensure the outer case remains cool to the touch. Certifications: UL and cUL approved.